This is cool textile basket made by Ann-Kristin Kristoffersen from quilted dense material. 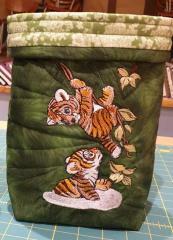 It is decorated with Tiger cubs playing in jungle embroidery design made in cartoon manner. 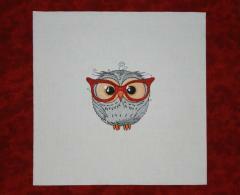 So this work piece is mostly suitable for child’s room but you may use anywhere you want. 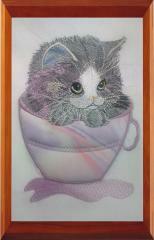 Embroidered picture is made on nice printed fabric in natural style. So it seems that little tigers are playing in forest. 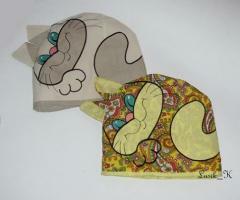 Very effective design of the torn fabric from which the cat's head looks. 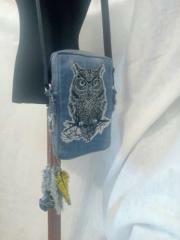 If you have torn jeans, such embroidery will not only beautify them, but also eliminate the tearing of the fabric. 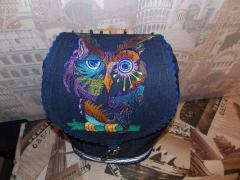 It is also very impressive such embroidery looks on bags, jackets. To realize such a non-standard embroidery project, consider the features of machine embroidery on the skin. Many embroiderers think that embroidering on leather or leatherette is an impossible task. 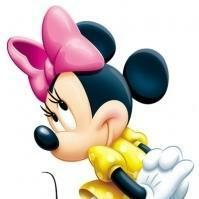 In fact, everything is not as difficult as it seems at first glance. First, materials such as leather and skin replacement do not forgive mistakes. That is, if you have already made a needle puncture, it is impossible to remove it. It will not drag on and will not disappear by itself, as on other bases for embroidery. 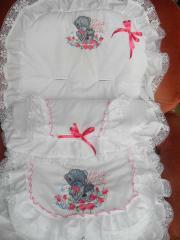 Secondly, before embroidery, it is recommended to duplicate the material with ordinary sewing non-woven fabric. Thirdly, it must be remembered that leather materials, like any other fabric, are of different thickness and softness. They also vary in density, weight and hardness. Therefore, you should responsibly choose the material. For example, the softer and thinner the material, the easier it will be to seal it. Fourth, it is best to use a cut-off average density as a stabilizer. In some cases, the use of a detachable stabilizer is permitted. Fifth, it is recommended to wrap the hoop with soft material before stitching the material. It is also necessary to weaken them so that they leave behind traces. An excellent option would be to use a magnetic hoop, if any. Finally, reduce the embroidery speed to reduce the load on the embroidery machine. It will also help. prevent skipping stitches. On a brown leather background. 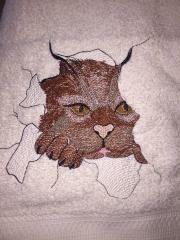 Machine embroidery design with a cat in fabric will look incredible. This idea is great for creating an original gift for friends, family and acquaintances. Decorative (not New Year) attributes of the interior: accent pillows, panels, etc. Cats in the interior is a beautiful, lively and very exciting topic. It can carry in itself the character of ethnic coziness of country style, the folklore charm of nature and even a little mysticism. Enough to approach her with imagination. Applique machine embroidery The head of a kitten is created taking into account just such an all-encompassing charm of a cute animal. Despite the fact that the Applique for machine embroidery is presented in our catalog in a homely cute style, it can also be successfully used in various ethical interior styles and even in the popular Kinfolk style today. Machine embroidery appliqué - how to embroider on fabric for framing? To decorate such a stylish appliqué with decorative pillows, follow the instructions below. Take a ready-made cover that fits your pillow size. Wash and dry it. Spray the temporary fixation glue onto the web of the cutting stabilizer and glue it to the fabric. Tie the fabric together with the stabilizer into the hoop. Load the hoop into the machine and embroider the horn with the necessary color. When the machine sews the first circuit, stop it. Attach the desired flap mani top. Continue to embroider the design. At this stage, the machine will embroider the second circuit, thereby sewing the fabric you have attached. After this, cut off excess fabric close to the contour. Finish embroidering the design to the end. Your appliqué for machine embroidery Deer Head is ready! Useful advice from: For such an embroidery project as an appliqué, it is also convenient to use adhesive tear-off stabilizer Madeira Cotton Fix. Such a stabilizer clearly fixes the fabric and comes off without a trace. In addition, you can use Madeira Cotton Fix for velvet, leather, suede, embroidery cuffs, collars, knitted fabrics, highly elastic fabrics, for quilting technique. Author: Elisabeth Hodl Author comment: "my new completed set this morning. 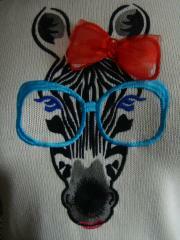 Just love my Zebras . They will be joining me on the 26th at The Forest Hill Markets." 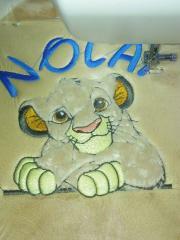 Author: Nancy Lee‎ Author comment: "Cover of the Juno Bag with awesome embroidery design!" 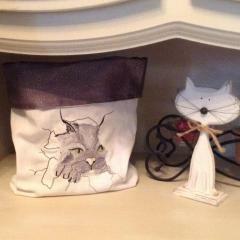 You want to decorate the bag - this design is for you! 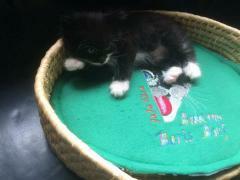 Want to embroider textile? This design is great with this. cope. Today we will look at how to embroider a free machine embroidery design with a cat on the popular materials that are used for sewing bags. 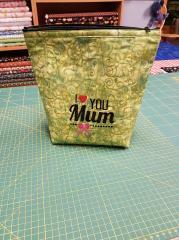 For example, everyone's favorite and multifunctional shopping bags, as a rule, are sewn from linen or cotton fabric. In order to embroider on such material you will need: Tear-off or detachable meckle stabilizer Glue-gray temporary fixation, for example, GunoId KK100 or Madega Tetrogu 5rgau Adhesive M5A 1100 Printed Design Template Washable marker, for example, from the manufacturers Clover, Hemline, WelIpaft free Machine Embroidery Design Embroider on such sufficiently dense fabrics is a pleasure. They are stable, flexible and, often, there are no big problems with them. First, you must correctly position the embroidery on the money. To do this, use an erasable marker and a printed design template. This paper pattern is a full-size design, with a marked center of embroidery and axis direction lines. These marks are transferred to the fabric by a marker. Now you need to stabilize the fabric. To stabilize, use temporary fix adhesive. It is important, during wading, to ensure that the marks on the fabric coincide with the cancellations on the hoop. At the end of the embroidery, crucify the fabric and remove the excess stabilizer. Nothing complicated. But in order to put embroidery on the skin, from which handbags are most often sewn, you have to work hard. Author Alison Wakely‎. 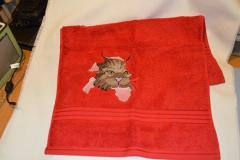 Free download here Embroidered towels are just that simple classic that will always look stylish. And the embroidery of towels does not mean at all that you will work as a seamstress on a set from morning till night. This simple yet stylish ornament will make your towels visible in your bathroom. This design has a logical docking. Size: 7.32 x 6.93 ' Today we will tell you how easy it is to embroider. . For this you will need: Terry towel Medium Density Stabilizer Glue spray temporary fix Water soluble stabilizer (for example, Sulky Ultra Solvy) or Madeira Easy Aqua Supreme Topping Machine Embroidery Design In the beginning, you need to wash a towel and only then embroider. After the towel dries, spray a temporary glue onto the stabilizer web. Glue the fabric to the stabilizer. Attach a water soluble stabilizer on top. Sew the fabric together with the stabilizers in the hoop and embroider the design. After embroidering, crucify the cloth and remove the excess lower cut-off stabilizer first. Then tear off the top water soluble. To remove small, inconspicuous pieces of water-soluble stabilizer, soak a towel in warm water and let it dry. 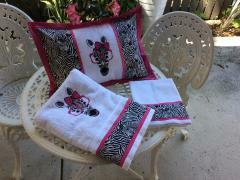 The original and simply unusual machine embroidery for towels is ready. In order to create a whole collection of towels for the whole family with the help of one design, simply change the color scheme, and use a different color. So everyone will have their own color and their own towel. Author: Elisabeth Hodl Author comment : "Another different cushion with the Cat trying to get out of the Bag"